February, 2015 | H&R Group K.K. Aichi is well known as a centre of Japanese industry, but what is less well known is that it is also the birthplace of one of the world’s leading ceramic dinnerware “china” brands, Noritake. In Japan the word Noritake evokes images of high quality and prestige, it is to Japan what Wedgwood is to England. While the original Nagoya factory in no longer in full scale operation, there is in its place a wonderful garden, museum complex, craft center and restaurant. As it is a mere 15 minutes walk from Nagoya Station, it makes an excellent day out. In 1904 Nippon Toki Kaisha, Ltd. (“the Company that makes Japan’s Finest China”) set up a factory in the Noritake area of Nagoya in which it planned to create first class ceramics for export to Europe and the US. Ten years later they created “Sedan”, their first Western style dinner set to compete with the established elite of the European porcelain companies. In 2001 to celebrate the company’s upcoming centenary, Noritake Garden (Noritake no Mori) was built on the grounds of the original factory. It has since won various awards for design and beauty. There are a whole range of activities for you and the family at the Noritake garden. You can visit the Meiji era red brick buildings of the historical zone. The factory building was in operation until 1975, but now you can wander round it and learn about the fascinating history of the Noritake tableware. 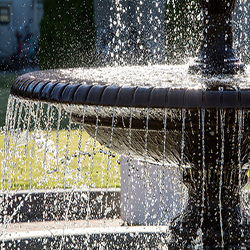 Afterwards you can enjoy the delightful gardens themselves, or sit and relax next to the charming fountain. Curious how bone china is made? Well visitors can witness first hand the craft that goes into some of the world’s most exquisite ceramics. Here you can watch some of the finest artists begin the process of mold production and glaze firing, through to demonstrations of freehand painting by master craftsmen. If you or your children are feeling particularly artsy, you can even paint and fire your own mug or plate. From there you can visit the Noritake museum showing products created between the Meiji and Showa areas, or head to the Noritake Garden gallery that exhibits various pottery, paintings and sculptures. There are of course plenty of shopping opportunities at Noritake Garden where you can pick up all kinds of ceramic goods. Not just a clever name, the ‘Stage Noritake Prestige Shop’ has high quality prestigious ceramic goods designed as gifts for loved ones or to add to personal collections. The ‘my Dining Coordinate Shop’ showcases a variety of products for the home as well as professional tableware. Here you can see the entire Noritake dinner range as well as professional goods not ordinarily seen by the public. In the ‘Palette Lifestyle Shop’ you can find a selection of international, bright kitchenware, and in the ‘BOX Outlet Shop’ you can pick up great deals from the Noritake factory-direct outlet store. If seeing all that dinnerware has got you hungry, there are two dining options on offer at Noritake Garden. For light bites you can head to ‘The Square Café’ where you can get Noritake tea, coffee, deserts or even light meals like curry or pizza. There is outside seating which you can enjoy on sunny days. For those wanting something a little more substantial you can try the fine dining ‘Kiln’ restaurant, serving French and Italian inspired cuisine on Noritake tableware. You can go for lunch, afternoon tea, or an evening meal. As the third largest producer worldwide, there can be no doubting the importance of the automobile industry to Japan’s economy, and here in Aichi we are at the heart of it. Of particular emincnce is the Toyota Motor Corporation. By production it is the largest automotive producer in the world and it is right here on our doorstep. Whilst its economic significance to the area is perhaps unrivaled – for the expat community especially, many of whom have commercial connection to the company – its cultural influence is also evident. The cities of Aichi have been developed with motoring in mind, with wide roads, expansive highways and cycling culture centred on pavements and sidewalks. The locals take great pride in Toyota’s strength and history, however for those of us without an emotional or financial connection to the company it may not be easy to understand the affiliation. However, a tour round the Toyota Plant may help. On the face of it, a trip to an automobile factory doesn’t seem like such a fun day out, but the Toyota Plant Tour is highly recommended. The first stop of the tour, which an be taken in both English and Japanese, is the Toyota Kaikan museum, a gleaming showcase for its new models and technology and, if you are lucky, robotics exhibitions. From there you will be taken to the Tsutsumi assembly plant where you can see the Toyota concept of jidoka – automation with a human touch – in action. From a bird’s eye vantage point you can see in real time how some of the world’s most famous models such as the Prius, the Scion or Camry come together. The next step on the tour is the welding area where the car parts are brought together and welded with exactitude and precision. For fans of robotic engineering, this is the stage for you as immense and intricate machines bring the metallic pieces of the automobile together, a stark contrast to the labour-heavy assembly line. To complete the two hour tour you return to the Kaikan museum where your tour guide can answer any questions you may have and you can enjoy learning about the Toyota Way, with exhibits labeled in English, Japanese and Chinese. Afterwards you can peruse the gift shop, take a break in the Starbucks Coffee shop and even get behind the wheel of the latest cars in the showroom. If you can’t make it out to Toyota, it is well worth a trip to the Toyota Techno Museum in Nagoya. This excellent tour takes you through the history of the Toyota Company, from its relatively humble beginnings as a textile machinery manufacturer to the modern day international behemoth it is now. 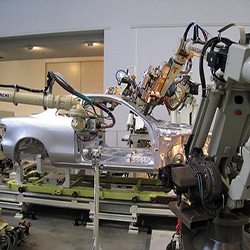 It also has exhibitions on the robotics and technologies of the modern car production process, some of which are interactive. For real car fanatics you can head out to the Toyota Automobile Museum to see a great exhibition of cars from Japan, Europe and the US from the late 19th Century up to the 1960’s. March starts out with a holiday for girls. The aptly named “Girls Day” coincides with the Hina Matsuri (Doll Festival), or Peach Blossom Festival, featuring a very traditional display of dolls. Complete doll sets will contain representations of the Emperor and Empress, three female attendants, five musicians, and assorted nobles and servants. Larger sets will have more. Smaller sets may simply contain the Emperor and Empress. The practice started in the Heian period, when superstition held that the dolls had the power to contain evil spirits. The dolls begin to appear in February and in true Japanese style they are removed immediately after the festival; tradition holds that leaving the dolls past March 4 will cause your daughter to marry late! The horror! If you don’t have a collection of hina dolls yourself (and it’s unlikely you would, considering how expensive they can be) you can still see some amazing collections around Aichi. Below are a few of the best places at which you can check them out. Tokugawa Art Museum has perhaps the best collection in the city and features diverse and impressive examples built and handed down through the ancient samurai family line. They are simply gorgeous, and display a level of craftsmanship in the various miniaturized accouterments that you will not often see. In short, this royal family has a collection of dolls befitting their status. Tokugawa Art Museum will display their extensive collection of dolls until April 8. Admission is 1200 yen, and if you make the trip I highly recommend you visit Tokugawaen, which is my personal favorite Japanese style garden in Nagoya. You can get there on the Nagoya Kanko Route Bus leaving from bus stop 8 in front of JR Nagoya Station. For more information on the museum and its surrounds, check out our article here. As the city of Seto, just outside of Nagoya, is famed for its ceramics (which you can read all about here), it makes it the ideal place to see beautifully crafted hina dolls. Until March 4, at Setugura Museum, the heart of Seto’s historical ceramics production, is a fine collection of up to 1,000 glass and ceramic hina dolls. The main display is on a four meter high pyramid – obviously nicknamed the ‘hinamid’ – but you will find other displays all around the town. Each year the residents of the traditional old town of Asuke work together to bring a pretty amazing collection of hina dolls. All around the town, until March 11, at over 140 stores or private houses you can see a variety of dolls, spanning the generations from the Edo period up to the modern day. Some are hand painted clay, others are made from old kimono fabric, and more are made by all sorts of interesting materials. It’s a great opportunity to see a diverse collection in a beautiful old town. For a few other suggestions a little farther afield, check out the ever excellent kikuko-nagoya.com website. You can get your nails done in Japan too, in fact the “nail art” they do here is pretty impressive. In general, the services are similar, but not exactly the same and those little differences can be a bit confusing. If you brave the unknown and try it out though, you may find yourself won over by the skill and attention to detail, not to mention the real focus on the customer typical of Japanese services, of the salons here. One big thing to note; walk-ins are rarely accepted here. You will need to make an appointment. If you are not comfortable enough in Japanese to attempt to do so over the phone, you can always just walk into the shop and ask for one. No, that wont make them magically speak English, but you may be able to communicate a bit better that way. I was going to spend some time going over other important points, but I actually found a really great blog from Tokyo with good information on the topic of nails. Check it out and see what you think. You can also try one of the many other nail salons available in Nagoya. Many of which are listed on the map below. If you have any other suggestions, let us know! Japan has a wonderful association with fruit. While it tends to be a little expensive (at least to the eyes of foreigners used to supermarkets crammed with the stuff for next to nothing), it is revered in status: apples are grown to extraordinary sizes and famed for the ‘honey’ within, mangoes are packaged like prized antiques, and melons in excess of 10,000 JPY are given as extravagant gifts. Another connection that the Japanese have with fruit is that they enjoy picking for pleasure. Whether with groups of friends, families or on bus tours, all year round Japanese will head to farms dotted around the country and pick fruit together. In early spring it is the beginning of the strawberry season. This is perhaps the most popular harvest period, particularly for families with children as ‘ichigo’ are just soooo kawaii! Japan currently has the largest production and consumption of dessert strawberries in the world and there are plenty of strawberry farms around Kanto that you can visit. Most cost in the region of 1,500 JPY per adult and offer tabehoudai – eat as many as you like – for a set time period, usually about 30 minutes. Below are just a few places that you can visit, though details are for information purposes only and Japan Info Swap does not endorse any of the places listed. Kawatsura Strawberry Farm has been going for more than 50 years and want you to taste strawberries without condensed milk and sugar. Their season runs from December 15 to early May with the prices decreasing in increments from 2,000-1,100 JPY for adults, 1,500-700 JPY for children aged 4-6 and 500-300 JPY for under threes. Opening times on weekdays are 10:00-16:00 and weekends from 9:20 until there are no red strawberries left. Nearest station: Naruto station is approximately 90 minutes from Tokyo station. 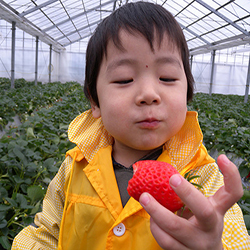 At Wada Farm you can pick organic strawberries from 9:00-16:00 for 1,500-1,000JPY for adults and 1,300-800JPY for ages 3-5. They also periodically provide live performances by local artists. Check their website for up to date details. Opening on February 22 Niikura Farm is a late starter. It is not a tabehoudai operation though and strawberries are sold at 300JPY for every 300g. They are open from 10:00-16:00, except Mondays and Thrursdays when they open at 13:30. You can make a reservation by calling 080-1173-1346 between 9:30 and 16:00. Nearest station: You can get to Seiseki-sakuragaoka in 50 minutes from Tokyo and then a 20 minute bus ride takes you to the farm. In the Saitama area you can find Fukai Farm where they practice natural farming. They are open from 10:00-15:30 and closed on Mondays and Thursdays. For adults of junior high school and above it costs 1500JPY, elementary school students cost 1300JPY and ages 3 and above are 900JPY for 30 minutes tabehoudai. Their website shows a calendar showing the quantity of ripe strawberries, so it is advisable to check before your trip. Nearest station: Iwatsuki station is under an hour away from Tokyo Station, and there is a 20 minute bus ride from there. With the strawberry plants at adult hip height you don’t need to break your back at Berry’s Farm Hasegawa. Also the strawberries are not in soil, so there is no dirt to clean as you eat. Picking hours are from 9:30 to 16:00. Elementary school students and above cost 1700-900JPY and those younger cost 1,000-700JPY for 30 minutes all-you-can-eat, though you can find a discount coupon here. Nearest station: You can get to Gyodashi in about 90 minutes by JR or 60 minutes by Shinkansen from Tokyo. At strawberry Hunt you can pick for 30 minutes and eat as much as you want from between 1,700 and 1,000JPY for those above elementary school age, 1,100 and 600JPY for 3 and above, with the under 3s getting free access. If you do want to enjoy strawberries with condensed milk, as many Japanese do, unfortunately they do not sell it on site, but they allow you to bring your own. You can find a 100JPY discount here. Nearest station: You can be at Takasaka in 75 minutes from Tokyo Station, and then ait’s 20 minutes in a taxi from there. Plum Blossom Viewing in Tokyo – The Top Umemi Spots! While the cherry blossom is the flower that tends to dominate the imagination of Japanese botanic appreciation, it is perhaps the plum (ume) blossom that should be the more celebrated. Reddish pink or white flowers, they are distinguishable from the sakura by their split ended petals and their strong sweet smell. Prior to the Nara Period (710-794 AD) it was in fact the blossom of the plum tree that Japanese referred to as hanami (flower viewing), as the flower bloomed in mid-February it more accurately heralded the coming of spring than sakura blossoms a month later. To this day there are many great ume matsuri (plum festivals) dedicated to the viewing of the ume blossom in parks and temples all over Tokyo, so why not wrap up warm and take the first picnic of the year under the branches of these beautiful trees. The 300 plum blossom trees of Yusima Tenmangu Shrine (Yushima Tenjin) were so loved by Lord Sugawara no Michizane that, when he was exiled to Kyushu, he wrote a famous poem that read “Let the east wind blow and send your fragrance / Oh, plum blossoms / Do not forget the spring / Even though your master is gone.” Today the shrine is devoted to a deified scholar and is thus popular with students. The month long Bunkyo Ume Matsuri reaches its peak at the end of February when you can enjoy traditional music, performing arts and tea ceremonies at weekends. Another shrine with 300 plus plum trees within its grounds is Kameido Tenjin. Like Yushima Tenjin, Kameido Tenjin is well known for its ume hanami (as a rule of thumb, shrines with the word ‘tenjin’ in their name, the Kami name of Lord Sugawara, tend to be associated with plum trees). There are a variety of events held and full bloom tends to be from the middle of February to the end of March. The shrine’s arched bridge is truly staggering, and it is worth checking out the famous ‘Goken no Ume’ tree that blossoms both red and white flowers. The festival at Hanegi Park is perhaps the one to head to if you want to get your fill of plum blossoms. With between 650 and 700 ume blossom trees (around one third dark pink, the rest white) the park is an explosion of colour and delicious scent throughout February. Located on Umegaoka (Plum Blossom Hill), when the weather is mild you can expect a joyful spring atmosphere with koto string instrument performances, outdoor tea ceremonies, haiku classes and mochi rice pounding exhibitions. There are food vendors selling plum-themed food including jelly, ripe plum madeleines and daifuku buns. Another Tenjin shrine, Ushi Tenjin Kitano shrine is dedicated to the aforementioned 9th century poet and plum aficionado Sugawara no Michizane. He would not be disappointed here, as there are dozens of the trees, particularly of the near red variety or the pink weeping plum blossoms known as shidare ume. On Saturdays you can sample sweet amazake sake, and on Sundays you can try the special Kitano no Fukukoubai, a local umeshu (plum wine). Though built in the 17th century under the guidance guidance of daimyo Mito Komon, the plum tree garden of Koishikawa Korakuen has retained its charm and beauty to this day. Purple and white flowers adorn the few dozen trees that surround the water lillied ponds of one of Tokyos oldest and most beautiful gardens. There is a small restaurant overlooking the garden that serves traditional Japanese cuisine. During the festival there are traditional music performances and Edo-style street arts. If you want to take in something even more striking and don’t mind travelling out of the city, you can do no worse than visit the Odawara Ume Matsuri. Odawara city in Kanagawa Prefecture hosts perhaps the most dramatic of plum blossom festivals. Set around the Soga Bessho Bairin grove, there are around 35,000 plum trees on show of all different colors, shapes and sizes, framed by the iconic backdrop of Mt Fuji. There are plenty of festival attractions as well including calligraphy and lion dances amongst others. Like me, you might have brought medicines with you from home when you came to Japan, but eventually those run out and you will need to get more somehow. Importing medicines and drugs into Japan should not be taken lightly. Some items are perfectly acceptable. But while items containing codeine are OK in Canada and Australia, if you try to bring or ship any into Japan you will rapidly find yourself in trouble. Similarly, cold medicines containing pseudo-ephedrine, which is used in the manufacture of methamphetamine, will get you into hot water at the airport. There are of course rules for bringing prescribed medicines with you when you come and limitations on over the counter medicines as well. It is not a considered a controlled substance or narcotic in Japan. The quantity is no more than one month’s supply. Disclaimer: when traveling to Japan with prescription and non-prescription medications you should consult the Japanese Embassy, or a Japanese Consulate, in your area directly for advice. You do not want to end up in jail or deported for cold medicine. For more information read this article on Importing medicines and drugs into Japan. Additionally, having medicines sent to you from within Japan is much more risky than importing them on your person. If you are caught with a few illegal codeine pills at the airport customs MAY simply take them from you, but having them mailed to you is a police matter, and you are much more likely to end up in court over the matter. Be careful, and research before you order! If you are already here, and are looking for a quick fix for a headache or other general pain you can find some common ibuprofen or aspirin based products over the counter at any drug store in Japan; unlike some countries, over the counter drugs are general not sold in supermarkets or convenience stores. Ibuprofen brands will generally have about the same dosage as western brands, but it is important to check the label to be sure as one dose may be 1 or 2 pills (to equal a foreign dosage). You can check this by looking for these kanji, 用法 or 用量, which means dosage, and錠, which means number of pills. For example: 用法 2錠 would mean the recommended dosage is 2 pills. While with Ibuprofen the dosages are similar, this does not hold true with all brands, or other medicines. You will find ibuprofen type products in the pain relief section of the drug store. Look for this: 痛み止め (i ta mi do me). When in doubt, ask for it! i bu pu ro fu en wa doko desu ka? ah su pi rin wa doko desu ka? ba…ffrin wa doko desu ka? If you are looking for pain relievers and can wait for them, you can buy some western brands using Amazon.com, and at Costco, at wildly inflated prices. Simply go to www.Amazon.co.jp and search in English for Tylenol, Advil, Bayer, etc, and you may find it right there waiting for you!